Enhanced 9-1-1 (E911) - More critical information will be transmitted to emergency responders, as this feature allows for not only the hotel phone number, but also the room number or any other descriptive location to be displayed, pinpointing the source of an emergency within a property. Universal SIP Phone Configuration - Adding or replacing phones becomes quick and simple with this improvement, which trades time-consuming manual installation for "plug and play" ease with more SIP phone models than ever before. Re-sellers and hotels alike will appreciate the efficiency of this auto-configuring SIP phone feature available for Polycom, Yealink, VTech and Cetis phones, with other phone brands in queue to be added. Browser Console Upgrades - The room name has been added to the Browser Console display, making the room's extension, room name, and guest name (if available) for every room now viewable through the console. This makes finding the correct room and extension number easier for hotel staff, especially for hotels where the room number and extension number do not match. Downed Trunk Alarms - Hotels can quickly react to downed incoming telephone lines via this enhancement which will instantly display an alert on the browser console, provide information on the issue at hand and allow management to input instructions. TDM Programming GUI Interface - This feature allows the quick and easy programming of the Series2 analog gateway via the Configurator web interface. This feature also includes a built-in help section for quick access to programming instructions. Improved Data Restoration- With easy access from the settings page, this new feature dramatically improves disaster recovery by allowing for quick restoration of the entire system by means of an interface between Voiceware and the TDM features provided by a Series2 gateway. With Voiceware 2.2, complete post-disaster restoration can be achieved in as little as 15 minutes, enabling staff to quickly get back to serving customer needs. Language Localization - Based upon login credentials, the browser language can now be set to Spanish, in recognition of the diversity of locations and cultures that Phonesuite serves. Enhanced TDM Failover Feature: Voiceware 2.2 has enhanced failover. In the event all connections to the internet are lost, this failover allows a Series2 system to failover from SIP to a PRI or analog trunk without interruption of service. 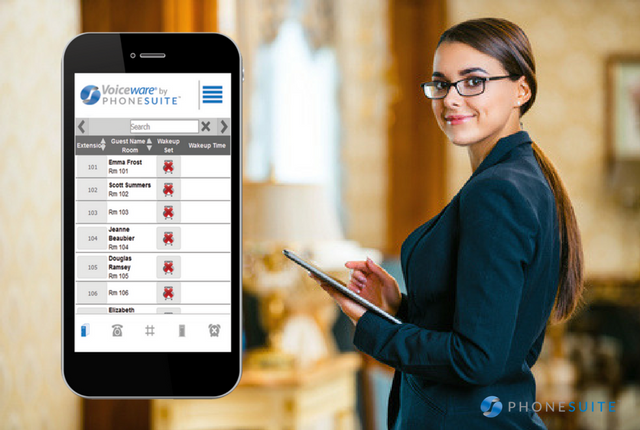 Phonesuite is the single-sourced, hospitality communication solution for hotel managers and owners who need a reliable, simple-to-implement telephony platform that supports both SIP and analog phones. For over 25 years, PhoneSuite has been the proven choice for modern, open-architected integrated hotel communications for over 5,500 hotel installations. Our products, combined with our nationwide dealer support and engineering expertise, create reliable communication solutions that meet or exceed all hotel requirements. In addition to our local and regional reseller channel, our turnkey solution is also now available factory direct. For more information, visit Phonesuite.com or email marketing@Phonesuite.com.